Mount Kilimanjaro is a good trinitarian: three in one, one in three. Kibo is the spirit, the "wild-child" that rises unexpectedly and hovers in the wind. Shira is the father, the ancient of days who supports it all. And Mawenzi, brittle and fractured, is the son (For a less theological--and far more responsible--explanation of these things, see here). The windy head of Kibo is pictured on the left, the fractured and "unclimbable" Mawenzi appears to the right. Note the broad col between them. The drawing, titled Der Schneeberg Kilimanjaro von Machame aus, or "The Snowmountain Kilimanjaro from Machame" was published in 1869 in the volume Reisen in Ost-Afrika in den Jahren 1859 bis 1865 (Otto Kersten, ed.). Here is the link to the post where I found it. A six-kilometer col (or saddle) forms a bridge between Kibo and Mawenzi. I settled on a rock at Barafu Hut and looked down on it. Capturing this "lay of the land" is helpful in visualizing an odd story that, they say, came down from Ethiopia. Some call it a myth. Others call it foolishness. I'm not sure I believe it myself, and probably wouldn't bother to write of it, except for the fact that I have my pen in hand and you have enough curiosity to read it. This 17th-century AD fresco was originally from a church in Lalibela, Ethiopia. It likely depicts Saint Mercurius as an equestrian figure. Other claim it is the Queen of Sheba riding to meet Solomon. The fresco is now housed in the Addis Ababa National Museum. Image detail from here. A very long time ago a wise king sat on the throne of Israel. His name was Solomon and his father's name was David. People came from all corners of the earth to witness Solomon's splendor. Among them was a queen from a faraway place known as Sheba. * While the Bible describes the relationship between this king of the north and queen of the south in discreet terms, rumors ran in many directions. Among them was the idea that the royals conceived a child. That child would be called Ibn al-Hakim ("Son of the Wise one") in Arabic or Ibn al-Malik or simply Menelik (or "Son of the King") in the Afroasiatic tongue of Amharic. He would also be Solomon's firstborn, his rightful heir, and, as it is claimed, a spittin' image of his grandfather David. Solomon gave his own ring to the child's mother as a future gift. Tiny Menelik was carried back to Africa in the womb of his mother. There he was born and grew to adulthood. Only then did he make a visit of his own to Jerusalem to meet his father. Needless to say, when the wise monarch saw the handsome young man--with the ring on his hand--he was overjoyed. None of the splendors of Jerusalem were withheld from the lad, even the Ark of the Covenant itself. Eventually Menelik returned home, bringing the Ark with him. Others say Menelik obtained the Ark by trickery and stole it. The act plunged his father into a blue funk and straight into the arms of the idolatrous daughter of Pharaoh (read here: Ethiopia just dunked on Egypt)! Whatever the case, it was Menelik who was responsible for bringing this Israelite treasure-box to East Africa. The local faithful claim it is there to this day. Seeing the face of this "Arabian warrior" reminds me of Menelik I. Here is the link to the original image created by mammouthe30. All these events reportedly took place in the distant and dusty days of the 10th c BC. 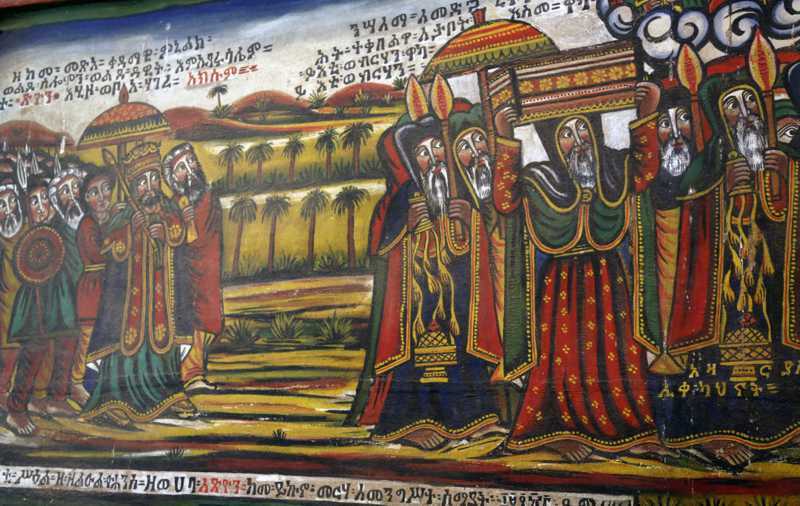 The core of the "official" story may be gleaned from a 14th c AD book of Ethiopian tradition known as the Kebra Nagast ("The Glory of the Kings"). ** The lore is likely older, maybe much older, but no one really knows. For some Bible Land Explorer readers, none of this comes as a surprise. These rumors have been often repeated. But here is where our story gets even more curious and relevant to our Kilimanjaro climb. Apparently, old Menelik was doing the circuit of his southern boundary when he found himself in the heights of Kilimanjaro. He reportedly camped on the saddle between Kibo and Mawenzi. He was within eyeshot of our camp at Barafu Hut! I scanned the alpine desert trying to imagine what an expedition party of African royalty would look like. The desolate col between Kibo and Mawenzi. Evening view from Barafu Hut (15,239') to Mawenzi (16,893'). Perhaps it was the combination of his age, the thin air, and bleak landscape (I readily identified with all three of these!) Menelik was led to believe that he was dying. Determined to go out in style, he arose on the following morning and continued trudging upslope. He was accompanied by his nobles and his slaves who ported a vast treasure. They disappeared into the womb of the mountain. Clouds likely rolled in and obscured the ascent from the eyes of the soldiers who waited below. When the party descended again to the view of the camp, it consisted of only the nobles. The body of Solomon's eldest son was hidden somewhere in the crater on the top of Kilimanjaro. With him was the treasure, including the precious ring, still on his finger. None of this has ever been found in the eternal ice of the mountain. Is it a myth? Is it history? Is it something between? I arose and slipped my notebook back into my pocket. The wind between Kibo and Mawenzi was cold against my skin. The magnificent mountain is a magnet for story. Photo by teammember Nico Roger. *In the Ethiopian tradition, the name of the queen is Makeda. Her royal line continued into the last century and is best remembered with the crowning of Haile Selassie (or Ras Tafari) as emperor of Ethiopia in 1930. The event set the Rastafarian movement in motion. To add just one more detail of interest to the mix, the raggae-master Bob Marley was a noted Rastafarian who named his daughter Makeda after the Queen of Sheba! **A digital translation of Budge's translation of the Kebra Nagast is available here. ***You can read of this encounter in an article titled, "Ancient and Modern: Some East African Mountain Myths" (The Alpine Journal 1995: 105-112). The author, John Temple, claims this story of Reusch came out of a 1932 publication of the Mountain Club of East Africa, The Ice Cap. I was unable to lay hands on this rare publication (few copies have survived) but I did find Temple's work. Menelik I carries the Ark of the Covenant back to Ethiopia. This picture is on display in Ethnological Museum in Addis Ababa. Digital image found here. Afterthought: Steven's Weitzman's Solomon: The Lure of Wisdom (Yale, 2011) is a delightful fireside read. Weitzman does a good job of not only discussing the life of Solomon as found in the biblical text, but selectively introducing the reader to the broader traditions about Solomon's legacy in the post-biblical period. For another, older collection of post-biblical stories of Solomon, see John D. Seymour, Tales of King Solomon (Oxford, 1924). Walter Brueggemann's Solomon: Israel's Ironic Icon of Human Achievement ( University of South Carolina, 2005) is, well, classic Brueggemann!